Help us raise money for your charity! Money raised here, stays here! Isle of Wight Day want everyone to celebrate the Isle of Wight in all it’s glory and in the process raise some money for your local charity. Isle of Wight Day is giving you some tools to raise some money for your charity. Take part in our events and raise some money for your charity. You may even like to use our Nipper mascot to raise awareness of your charity and Isle of Wight day before the big day. He always pulls a great crowd and more people for you to talk to about the great things your charities do on the Island. Get involved with Isle of Wight Day and together we will help raise money for your charity. If you are able to Don the Nipper costume and raise money for your charity then we would love to hear from you. We have many events that Nipper will be attending over the summer and any charity that think they can use Nipper to benefit their cause we would love to hear from you. 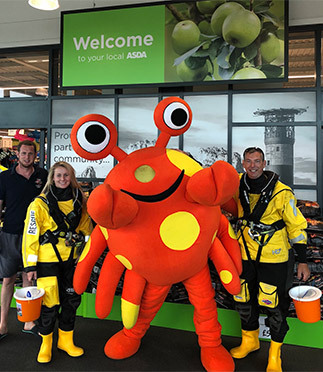 “Being able to use Nipper at our fundraising events has vastly increased the donations we are getting to support our crew and the important work they do. Seeing the kid’s react to Nipper is a joy and they respond to him very well. Even adults seem to react positively to him.